We have finished up our Tropical Mother’s Day collection, but we’re not done with the tropical projects yet! 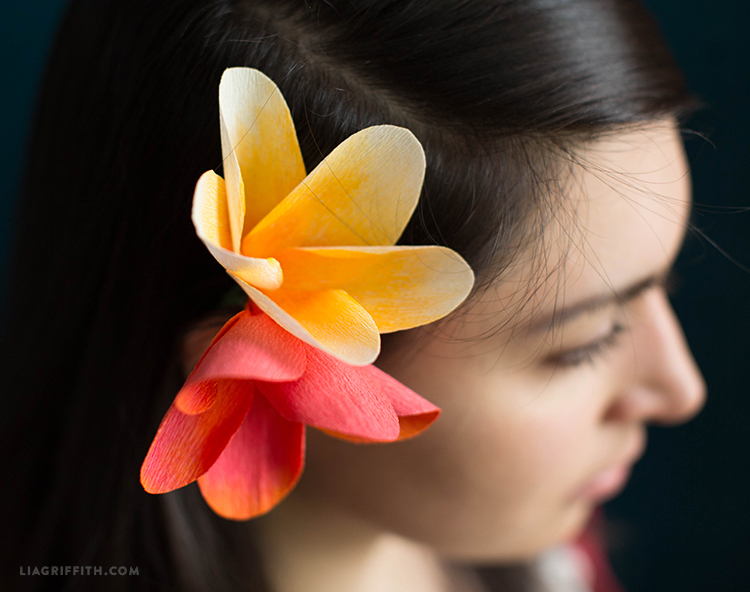 Here is a super simple tutorial for making crepe paper plumeria blooms. 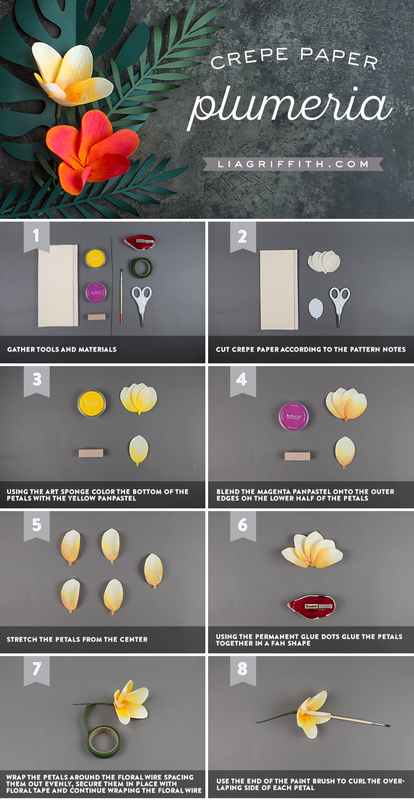 Plumerias, or frangipani, are found in tropical places like Hawaii and the Caribbean, but with the magic of paper flower making, you can display some gorgeous plumerias wherever you are. These flowers are perfect for transitioning into summer home decor, or as decorations for hosting a tropical themed gathering. Print the PDF template at the bottom of the post and cut petals according to the pattern. Using the art sponge, color the bottom half of the petals with the yellow pastel. Blend the magenta pastel onto the outer edges of the lower half of the petals. Curl your petals by stretching them from the center. Using the permanent glue dots, glue the petals together in a fan shape. There are 5 petals per plumeria bloom. Wrap the petals around the floral wire, spacing them out evenly. Secure them in place with floral tape and continue wrapping the floral tape down until the wire is covered. Use the end of the paintbrush to curl the overlapping side of each petal. 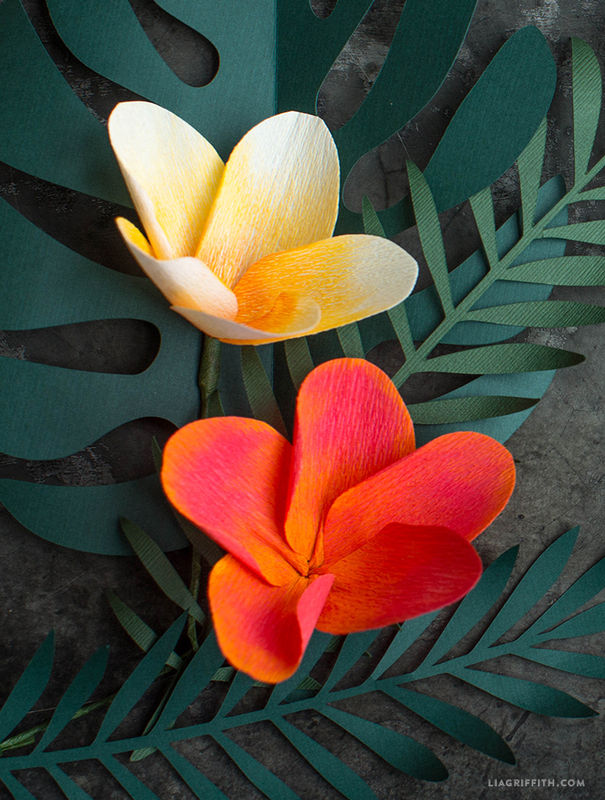 Watch our video tutorial for a visual guide to crafting a crepe paper plumeria! Before crafting with the crepe, we always recommend that newbies take a look at our Crepe Paper 101 video for guidance on cutting and stretching the material. Other than that, this flower is pretty straightforward! You are welcome to practice blending the pastels on a sheet of regular copy paper before adding color to the crepe. 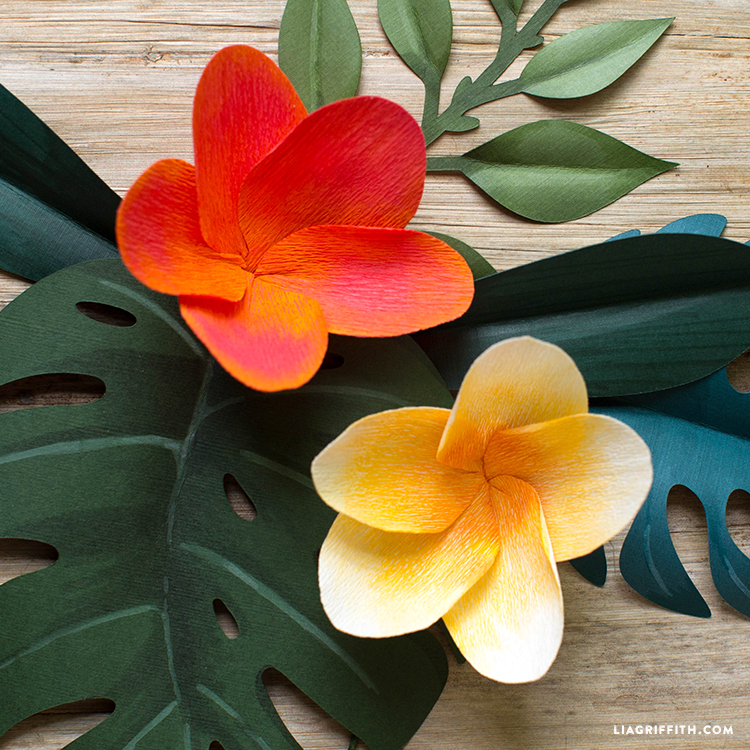 If you want to add tropical leaves like the ones in our photos, find our templates from our tropical leaf wreath. Does the panpastel leave a residue afterwards? I want to use this technique for my wedding paper flowers but I’m worried about getting the color on my dress. It’s not supposed to leave residue (and we haven’t noticed it) but I wouldn’t recommend getting them too close to your dress, just in case.